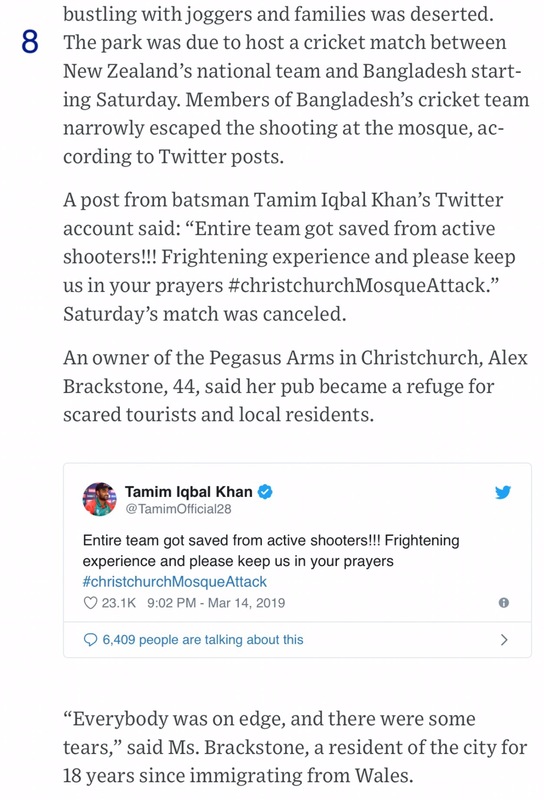 After a brief respite from the ongoing “terror” that is supposed to have us gripped with fear, and practically throwing our wallets at anyone who can protect us—here we have yet another story out of New Zealand. 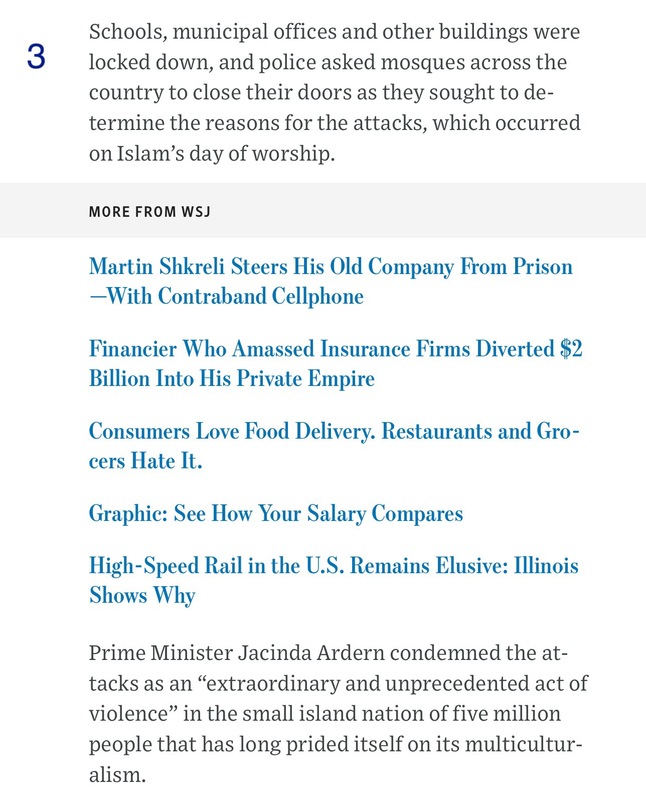 I have taken screenshots of an article from the Wall Street Journal from this morning, and I’m laying them out here for purposes of preserving them as it was presented. How is it that we have these clear photo's of the writings on the guns already? Wouldn't these be in police custody? How did the media get them so quickly (8:14)? Numerology level, we can note 49 = 4+9 = 13 (number of victims). The name of the town where "the gunfight" took place: "christ + church". One of the two mosques attacked is located at an "101" avenue. It is very rare for an attack to be filmed like this. It is also very rare that Muslims are affected. Not surprisingly, the video is of poor quality (360p ? and again). So real event or not ? I would be less categorical about this case. I may be wrong but I am sure during the shooting in the raw video the camera veers to the left where we see dead bodies before he has even shot there and quickly turns back around to the right while he continues to shoot. datspot » Fri Mar 15, 2019 11:16 pm wrote: How is it that we have these clear photo's of the writings on the guns already? Supposedly, these photos were taken from the shooters Facebook page. the media are still going with the “Lone Wolf” angle despite there being footage of two other shooters wearing hats. As you may have heard, it has been alleged that a white supremacist Australian has recently killed 50 or so people in a shooting rampage in Christchurch, New Zealand. 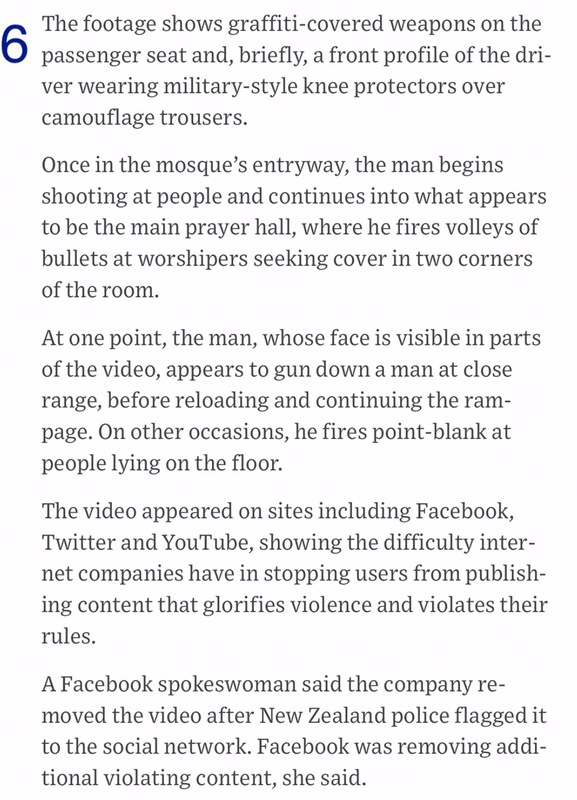 And it is also alleged that he live streamed this massacre on his Facebook account. "Authorities" have shortly afterwards urged websites and social media platforms to stop this video from being shared (and seen). So I am not posting a link to it. I'd recommend searching for it on Duckduckgo rather than Google. - At 6:38 or thereabouts we seem to be entering some sort of "CGI realm" where everything looks like we are playing Golden Eye on Nintendo 64. - The mosque architecture and layout is super atypical with worshipers segregated into various rooms and opposite corners of the same room while praying by the looks of things. - Anyone who has ever owned a PS2 or later generation game console should be easily able to tell that the sequence between 6:38 and 8:46 is all CGI. - The perpetrator returns to his car to retrieve another weapon to shoot many more rounds to people he'd already killed a few minutes ago. - There is hardly ever any blood to be seen anywhere throughout all this. Even when he's shooting at "corpses" at close range. - Towards the end of the video, the perpetrator shoots at people on the sidewalk without bullets smashing (or even penetrating through) his windscreen. In short, there are plenty of anomalies in this video. It looks like a demo of a beta version of some video game that needs tons of improvement before it can be released. I watched the video, completely fake IMO. The gun control agenda came out immediately, and he was a right-winger. I'm not an expert on video games, but it did have that CGI feel in many spots. I always love when the authorities not only have the script (manifesto) but they also have video and the guy's life story with the first news broadcast. I was also glad the guy gave them a birdseye shot of his face in the beginning of the video. I wasn't seeing much blood until they showed the people huddled by the window against the wall. The pile of bodies (inching to get out the window) reminded me of the Holocaust pics of piled bodies. Nobody is running, except one guy who literally runs in front of the camera to escape the shooter. I tried to post 3 comments on the Yahoo story I mentioned above and all 3 posts have vanished. All I said was - not what the video shows. Another sign this is nothing but propaganda supported by all media! In case it has been missed, there was a somewhat similar shooting incident in a school in Suzano (São Paulo, Brazil) on the 13th, just two days before the NZ shooting. Two gunmen killed 5 students (reports said "6" the first couple of days) and 2 adults, before "suiciding each other". I read somewhere about another 17 wounded, which is surprising when you consider they had only one firearm (a revolver). The "lone wolves" were allegedly acting out a video game. It was also filmed (apparently not just by CCTV), but I haven´t had time to look into that. Only to point out that I just realized that the “Call of Duty” video of Brenton Tarrant could be a fake. For sure you have the video, please check at 8:57 when he get on the street after the first raid, up to 9:11. Keep uo the good work, thanks for everything. I thought the observations were well worth noting here. When I get the time, I’ll make my own as well. This story is clearly bogus and utterly contrived. It stinks to high heaven. Thank you to our members who have chimed in thus far. Did anybody notice those light rendering glitches for instance around 8:10 and 8:30 in the video? It looks like what is supposed to be reflected sunlight on the ground keeps flickering on and off. Is it just a side-effect of the low-resolution? It always seems that these suspicious events are captured in extremely low-quality (Moon Landing, 9/11 Kennedy Assassination.) I wonder why? datspot wrote: How is it that we have these clear photo's of the writings on the guns already? Apparently this Kiwi “White-nationalist/Islamophobe” is quite the history buff. For some reason he thought it important to reference two WWI battles in Armenian script on the lower left magazine in the above pic. Top: Battle of Sarikamish – Turkey’s loss to Russia was blamed on Armenians and used as a pretext to commence the 1915 genocide. Bottom: Battle of Sardarabad – Turkey’s loss to Armenia’s military/militia thwarted it from annexing Armenia and annihilating Armenians. Nationalism of any stripe is a racist, hateful and downright evil ideology. Except for Israeli nationalism, of course. Everyone knows that G-d’s chosen nation is the only one that has a right to self-determination. I had trouble deciphering "Sarikamish" and "Sardarapat" from the Armenian text on that magazine. Kudos to Newsweek for providing clarification. The alleged shooter's references to historical figures were noteworthy and obscure. Among them was Novak Vujošević, an Orthodox Christian fighter in the Battle of Fundina, which took place in 1876 in the village of Kuči in Montenegro. The names Marko Miljovan Popović and Bajo Pivljanin, two Christian fighters who led forces against the Ottoman Empire in Montenegro and Bosnia, were also written on the weapons. The names Sarikamish and Sardarapat were written in the Armenian language, a reference to two battles against the Ottoman Empire that took place toward the end of World War I. The attacker also scrawled the named [sic] of Christian Kings from Georgia in their original language. David Soslani, a Georgian prince known for battling Georgia’s Muslim neighbors, was mentioned on the weapons. Perhaps a lengthy prison sentence will give this guy ample time to work on his Armenian spelling. Found by a friend on facebook, confirmation that the video is indeed a staging. 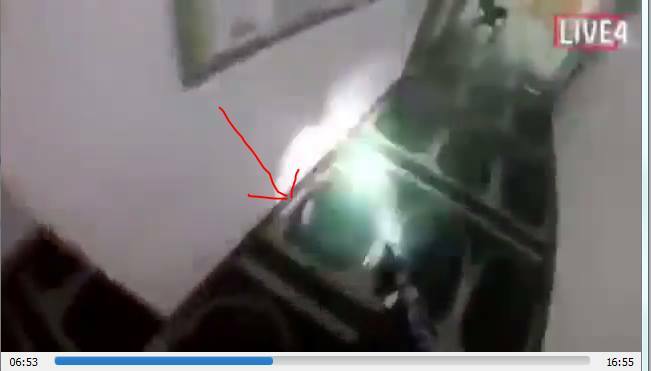 At 6:53: just after entering the mosque, the shooter illuminates a rectangular white object. 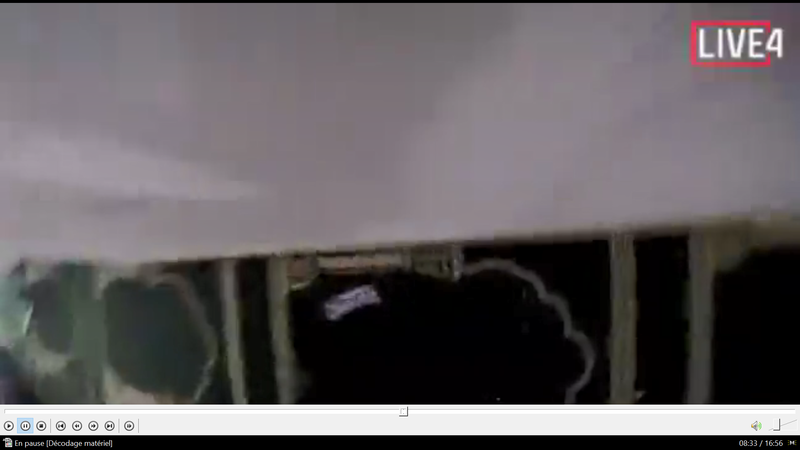 At 8:33: the shooter gets this object which turns out to be a magazine for his weapon. However, this video is supposed to have been broadcast live on facebook. You think the faithful ignored this charger before the coming of shooter ? This is therefore proof that this video is a staged production. These are not images of a real killing.